I have a confession. I’m not going to make it easy for you. This could be a hard post to read. It sure as heck was a difficult one to write. 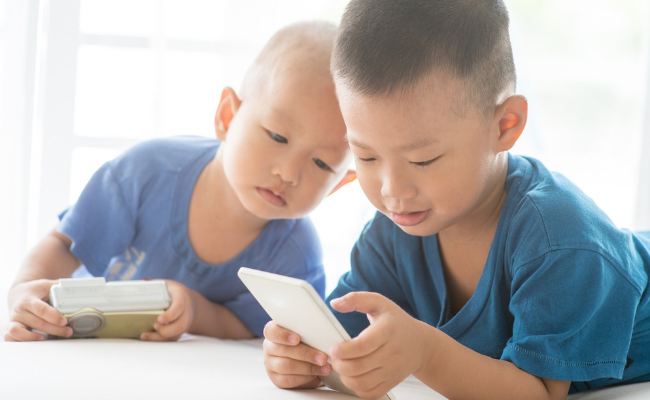 What are the effects of technology on our kids? I looked at some of the studies and research. What did I find? Technology has a HUGE impact on the brain, health, sleep rhythms, family life and child development (more about that later). But one discovery sounded alarm bells for me. In a nutshell scientists found that dopamine levels in the brain are doubled during game play. In another study, researchers at Stanford University performed brain scans on subjects playing a simple video game. There were many areas of the brain activated, but researchers were particular interested to see how the “the neural circuitries involved in reward and addiction” were activated. This happened in both men and women, but it was significantly stronger in men. You can read the study here. Before we go on I just want to provide a little bit of background information to help you understand the significance of this. Dopamine is a chemical that activates the reward centre of the brain. As our dopamine levels increase we experience pleasure. It is basically nature’s way of reinforcing behaviour that is necessary for survival. So simple things like eating will increase dopamine levels. When I find myself mindlessly scrolling through my social media feed far longer than I should. Every time I reach for my device even though I only put it down 15 minutes ago. Sound familiar? When I witness parents so engrossed by their phones that they don’t hear their kids desperately calling out for help. The summer I saw a young tween so entranced by his computer game that he didn’t bother to eat all day. Anything that causes the brain to produce a hit of dopamine has the potential to become addictive. In short playing games stimulates the brain the same way that taking cocaine, drinking alcohol or gambling does. I do need to point out that things like cocaine produce much higher hots of dopamine, but the response is the same. Once the brain becomes dependent on that dopamine you are on the road to addiction. To read more about addiction, and how it develops, take a look at this article. How many people are getting addicted? The good news is that the numbers are low at the moment. One study published in 2015 concluded that 1.4% of video gamers are addicted and 7.3% were problem gamers. The subjects were aged between 16 and 74 and were randomly selected from the National Population Registry of Norway. Males were almost 3 times as likely to be addicted. Subjects in the youngest age group were 3 times more likely to belong to the addicted group and 4 times more likely to be in the problem gamers group. The level of education did not seem to have an impact. The study looked at many different factors and is a fascinating read. The risk of addiction seems to be low enough that we don’t need to throw out technology screens completely. Still addiction is occurring in increasing numbers, so we have a responsibility to set limits for everyone, particularly for boys. Why would we continue giving our kids unlimited access to something that has the potential to harm, even if the risk is low? In this short video clip Simon Sinik talks about the effects of technology on the teen brain and how it can impact their life as an adult. What he has to say is very sobering. I’ll be the first one to say that I LOVE technology. My computer allows me to stay in contact with my family in so many wonderful ways. I love that I have easy access to millions of facts, recipes, movies, and craft ideas . I can even earn a part time income. But there is a darker side isn’t there? And scientists are only just starting to realize how all this technology is impacting our mental and physical health. And families like yours and mine are struggling for balance. This is not going away you guys. If anything the pressure is probably going to increase. We are exposed to new technology, apps, and social media everyday. And we are just starting to discover the effects of technology on our children (and us). It is going to take some brave parenting to resist this pressure. It is going to take some brave steps to break our screen habits. Read more about the effects of technology. I’ve got a helpful information sheet to offer below. 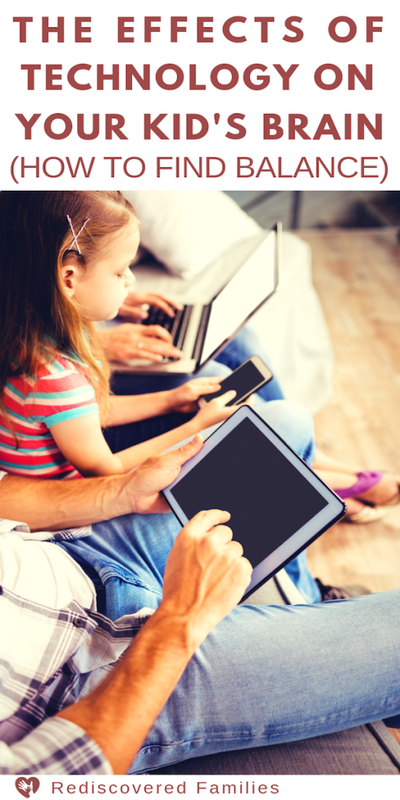 Take a good look at the way you use screens in your family. Decide if you need to make adjustments. You can find a tool to help you do that here. 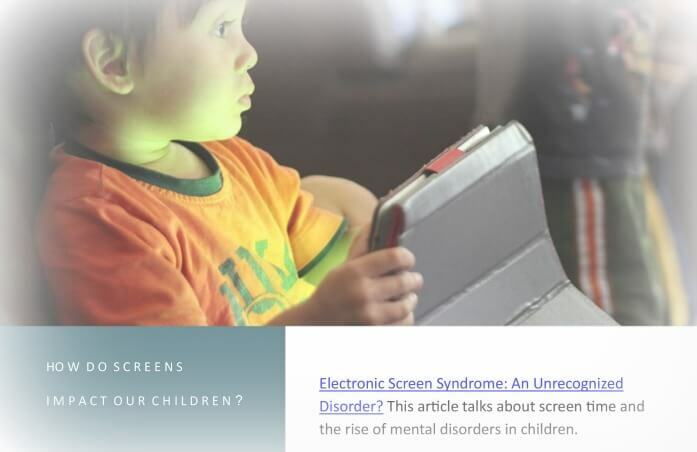 Screens impact our children’s brains in all manner of ways. Download an information sheet with helpful links and resources. You can access it for free in the library. Just sign up here. If you are already a subscriber, you should have received an email directing you how to access all of our subscriber-only freebies. Schedule regular recreational screen use for a limited amount of time. This way your kids will know what to expect. Experts recommend no more than one to two hours per day and even less for the little ones. Here’s a super helpful device that will make this regulation easier. Every family has to figure out their own schedules and limits. There is no right or wrong way. You need to find out what works best for you. 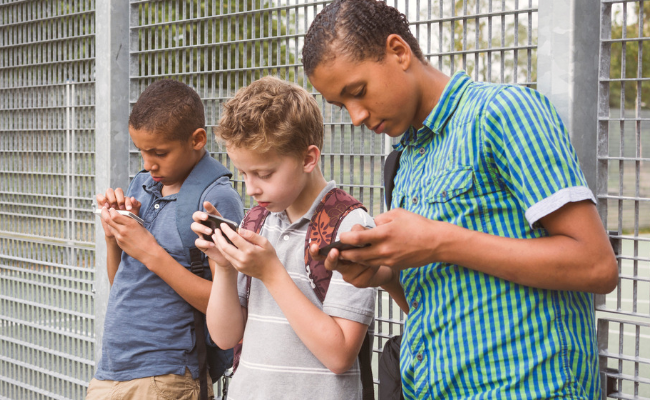 Obviously helping children learn to self-regulate would be ideal, but the addictive pull of the screens is going to be very hard for young brains to resist. This is probably one of those instances when we have to step in to regulate our kids until they have the maturity to do it for themselves. Shut off all screens one to two hours before bedtime to allow kids (and grown-ups) to unwind and allow the natural production of melatonin (the sleep hormone) in the brain, so they can sleep. All this information about the effect of technology can be very alarming. The idea of setting limits and (even worse) having to enforce them can be exhausting. 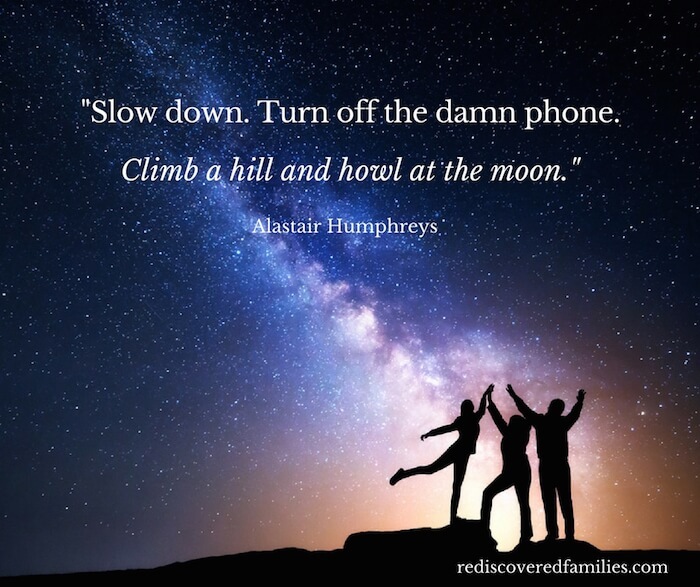 Facing our own dependence on technology can be scary. Still I have some good news! At first your kids may complain bitterly that they are bored and you may find yourself restless and irritable. This is to be expected. Remember this is part and parcel of withdrawal. We are not getting that Dopamine hit and everything else will seem dull in comparison. Fortunately it doesn’t last long (unless you have crossed over into true addiction). 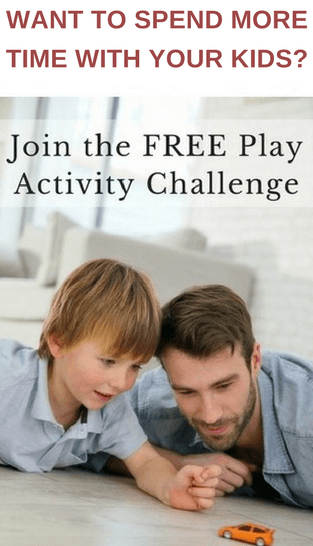 It won’t be long before your kids begin to engage in free play and find lots of creative things to do and that has all kinds of benefits. You’ll suddenly find you have time for all kinds of family fun, discover the joy of play, and maybe engage in some acts of kindness. Not sure about this? Read Unplugged: Why We Quit All Screens to see the goodness that happens when the screens go off. I understand if you are struggling with this. I am struggling too. Even though I do not have children at home any more I recognize that I need to stop mindlessly using my computer. And it is hard. I know that it is not easy to set up controls and regulate our children’s screen use, because they won’t thank us for it. But we can be brave together. As parents we work hard to keep our kids away from other addictive substances. Now we need to start protecting them from the harmful effects of technology. Did you enjoy this post? Was it helpful? Please share and tell a friend! If you want to save the post for later pin the image below. Thank you for sharing on this topic. 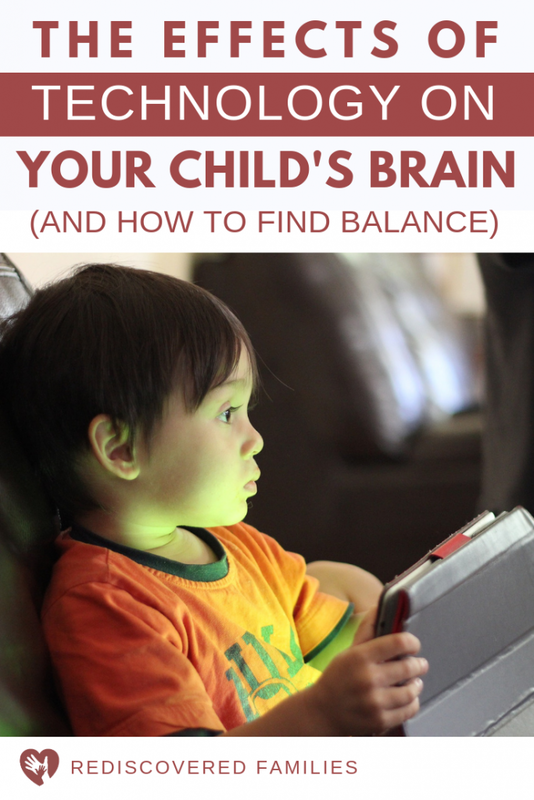 In our home, we do our best but it’s we struggle with staying balanced on a consistent basis. 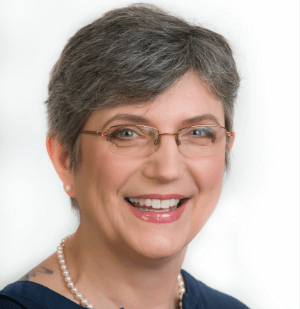 I read Kristen’s article as well…agreed, totally frightening stuff. The article about gaming being compared to cocaine use is shocking. This article has inspired me to keep going. It’s a reminder that we are called to be parents…not friends to our kids when it comes to looking out for their best interest. Thanks Kelvin. It is a struggle to find a balance, but it is one that is worth pursuing. The realization that that gaming looks the same as cocaine use on brain scans is horribly shocking. Perhaps it will provide some motivation for us to make changes. I agree that balance is key. Having said that I think some children will be affected by technology more than others. My kids found it hard to disengage, but my family seems to have a genetic predisposition towards addictive behavior. I wish this information had been available when I had teens. I’m glad that you are making active and imaginative play a priority. I’d love to know how your device-less week went. I have definitely seen the impact of screens on children’s behavior. I think it is a constant struggle for parents. It is a very interesting article about the effects of technology to children. I remember when i was growing up with Atari, Commodore and the Apple IIe, i was addicted to it and i even had to finish the game and stayed up till early morning and the result was my school schedule was totally ruined. My parents confiscated the video consoles and have limited to it. At this new ear its harder to put a stop on these devices. Even school assignment are handed down on an IPAD. I guess the trick is to have teach our children to have self control and do not abuse the technology on hand. Everything has to be balanced in order to be productive. Sleep is essential and not gaming to whole night till wee mornings.